Here is a table of calculations made using the HitModeler computer program, Version 1.1c, in April of 2009. You can use these results to check your version of the program. Each case uses a 100 mph hit angled at 45 degrees which is typical for a big league ball player. The first case was run by setting the drag coefficent to 0.0 to model a ballistic trajectory. Without any aerodynamic drag, the ball flies 669 feet. Obviously, aerodynamics must be very important because we don't see any 670 foot home runs in the majors!. The second case is a reference case. We set the location to Cleveland on an Average Day; 60 degrees F, 29 inches of mercury pressure, no wind, and a drag coefficient of .3. For this set of conditions, the ball flies 378 feet. Much more realistic than the ballistic flight. The third case looks at the effect of temperature. We set the atmospheric input to Hot Day. 90 degrees F. All other variables are the same as the reference. The ball now flies 387 feet. We gain 9 feet on the average day because with increased temperature, the density goes down and therefore the drag is reduced. The fourth case also looks at temperature. We set the atmospheric input to Cold Day, 35 degrees F. All other variables are the same as the reference. The ball now flies only 370 feet. We loose 8 feet to the average day because with decreased temperature, the density goes up and therefore the drag increases. The fifth case looks at the effect of pressure. We set the day to an average day, then click on "Specify" and enter 28 inches of mercury in the pressure input. The ball flies 384 feet. We gain 6 feet on the reference conditions because with decreased pressure, the density is decreased and the drag is reduced. The sixth case looks at the effect of wind velocity. We set the atmospheric conditions to Average Day and all other conditions the same as the reference. We then change the wind velocity to 5 mph. The ball flies 417 feet with the wind at the back of the hitter. Wind is very important. The seventh case looks at wind in the batters face. Conditions are set equal to the reference conditions and then the wind is set to -5 mph. The ball only flies 338 feet. The eighth and final case looks at the special conditions that exist at Coors Field in Denver. We reset the wind to 0.0, pick an average day, and change the location to Denver. Denver is the "mile high city" with atmospheric pressure at only 24 inches of mercury. The ball flies 405 feet. The same hit in Cleveland only goes 378 feet. 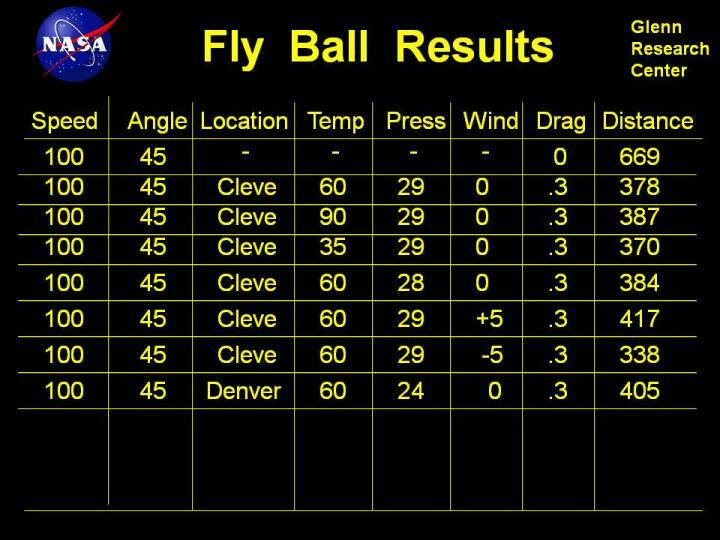 The reduced pressure and density in Denver has reduced the aerodynamic drag, so the ball flies much farther.